Tumbleweed Farm is currently blanketed by 2 feet of fresh snow. As I sit and write this post giant, beautiful flakes fall from the sky. It’s funny, we thought we were in the clear from a major snow storm this winter. It’s been rather mild, with only a few snow days since Thanksgiving. But now, we’re definitely making up for lost time. With no end in sight, we’re making sure to keep the farm kitchen stocked with the essentials– coffee, milk, soup ingredients, wine, flour (for bread baking and cookie making) and we’re regularly pulling out meat from the chest freezer for easy dinners. However, in the cold and dark season one thing that I’ve been enjoying more than just about anything, is a giant bowl of warm porridge in the morning. Many of you raved about my golden milk latte that I posted a few weeks back and today I bring you a porridge version of that comforting beverage. This is the kind of breakfast that will warm you from the inside out and is a great reminder to slow down, prepare something nourishing to help jump start your day, and savor every bite. 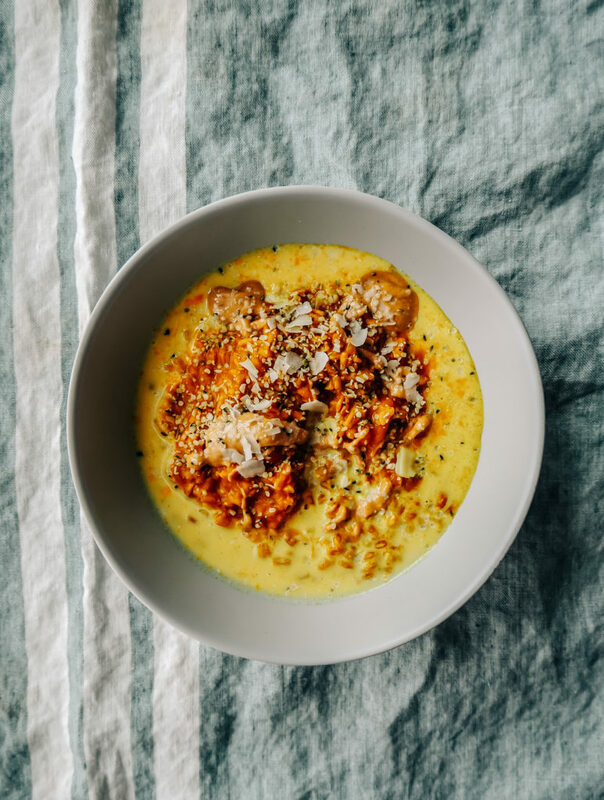 Instead of traditional oats I used farro for my grain of choice, and stirred in some pre-roasted pumpkin (but any winter squash variety will work), spiced golden milk, nut butter, coconut flakes, and hemp hearts. This porridge is definietly a new favorite and I’m so happy we discovered the beauty and diversity of golden milk. I imagine we’ll be adding the turmeric paste (which gives golden milk it’s famous color and flavor) to baked goods next. I’m thinking golden milk bran muffins are on the menu soon! Stay tuned. Also, the turmeric paste makes way more than you’ll need for this recipe so keep the leftovers in an airtight container in the fridge for up to 1 month. You’ll find yourself reaching for it often! Prepare the turmeric paste by adding all the ingredients to a small saucepan over low heat, and stir well to combine - it should form a thick paste. If the paste is too thick, add another tablespoon or so of water to thin slightly. Continue to cook over low heat for about 10 - 12 minutes. To make the porridge add the farro and 3 cups of water, cinnamon and salt to a saucepan. Bring to a boil. Reduce heat and simmer until most of the liquid absorbs and the farro is tender, about 25-30 minutes. Stirring occasionally throughout cooking. Once the farro is tender stir in the turmeric paste, honey, pumpkin puree and nut butter. To prepare the golden milk add all the ingredients to a small saucepan and heat through. Divide the porridge between 4 bowls and drizzle with the golden milk. Top with hemp hearts and shredded coconut and additional honey to taste. Andrea, your blog this morning is terrific (per usual). looking to change things up – this recipe is perfect to do just that! Stay warm while you enjoy your winter wonderland! Love this, but wondering if you have a recommendation for a brand of tumeric powder that is safely free of lead and/or arsenic. I have read that this is common. I am printing this out and putting at the top of my “to try” pile. It looks so dreamy. This looks great and perfect for all that snow. I hope you are handling it okay and it slides off the high tunnels all by itself! Can you suggest an alternative for Farro? use old fashioned rolled oats instead. Adjust the cooking time as needed.